I'm back on the wax track! The week before last I had a cold and lost my sense of smell, so that's why there wasn't a post last week. I couldn't smell anything! I regained my olfactory senses this week so I'm back on board. I think it was overall a successful wax week. I didn't really have a bad one in this bunch. My Thoughts: This to me smelled very similar to me to Yankee Candle Ocean Star. The only difference being was that Turquoise Sky had a slight cologne/masculine note to it whereas Ocean Star didn't. I liked this one. It was fresh and crisp and an all around likable scent. It had a good throw for several hours. 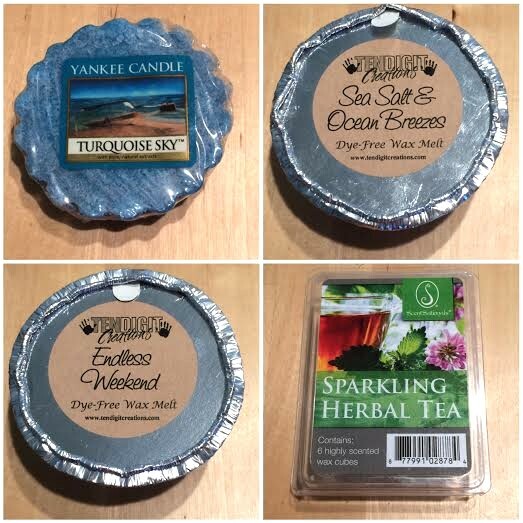 Where To Buy: Bed Bath & Beyond, Yankee Candle store, or Yankee Candle online. My Thoughts: This is a dupe of the Bath & Body Works scent which happens to be my favorite for spring and summertime. I love this scent because it's juicy, tart, sweet, fresh, and perfume-like all in one. The raspberry and floral elements give it that sweet and tart blend and the vanilla sandalwood give it that elegant perfume element. You can detect all the notes in this blend of scents. My only complaint is the throw on this wasn't as strong as I would of liked. It's not weak, but average. Where To Buy: Ten Digit Creations website. My Thoughts: This is hands down my new favorite scent of all time in the entire world. This has a 70% strong ocean, sea salt, and water note to it balanced by 30% of this perfume-y sophisticated note which I'm betting is the blend of the oud wood, oakmoss, patchouli, and amber. This smells like some luxury brand ocean-inspired perfume. It's fresh but elegant at the same time. This had a strong throw for several hours. I am in so much love with this scent! I went ahead after melting it in wax bought it in shampoo, conditioner, room spray, leave-in spray conditioner, lotion, and body spray. Can you tell I like it? My Thoughts: This to me smells like a chamomile tea bag. It's pretty straight forward. It smells like herbal tea. There isn't anything "sparkling" about it. I don't get any effervescent or fizzy notes, which is a bit disappointing since I do love those. That being said I do really like this scent. There are no frills about it, but it is a pure tea scent which is soothing and nice. This had a good throw for several hours. Where To Buy: ScentSationals website.